Three days of training camp have come and gone. Here are some interesting points and news from training camp so far. A total of 4,371 fans watched the Denver Broncos’ initial training camp practice of the 2012 season to mark the highest attendance total for a non-stadium practice in team history. The previous attendance record for a non-stadium practice was 3,103 fans in the first training camp practice of the 2010 season (Aug. 1). The overall attendance record for a training camp practice occurred at Sports Authority Field at Mile High on Aug. 7, 2010, when 20,782 fans watched the team’s Summer Scrimmage. The only player absent from practice was wide receiver Brandon Stokley, who had the flu. Limited in practice today were defensive tackle Justin Bannan (calf) and defensive end Jamie Blatnick (ankle). Ryan Clady, Zane Beadles, J.D. Walton, Manny Ramirez and Orlando Franklin made up the offensive line, as Chris Kuper continues his recovery from a Week 17 injury. Manning was quarterback and Willis McGahee joined him at running back in the backfield. Occasionally the team went with two receivers — Eric Decker and Demaryius Thomas — and two tight ends — Jacob Tamme and Joel Dreessen. When there was a third receiver in, it was Andre Caldwell. When there was a fullback, it was Gronkowski. On defense, Elvis Dumervil, Ty Warren, Mitch Unrein and Robert Ayers were the linemen. 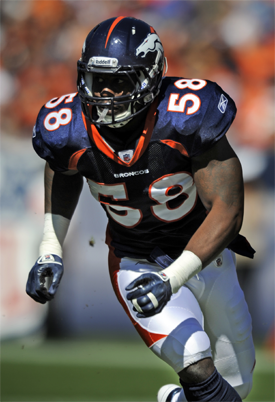 Wesley Woodyard, Joe Mays and Von Miller manned the linebacker positions. 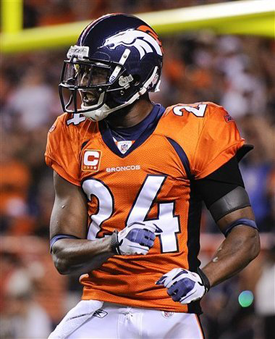 Champ Bailey, Tracy Porter, Mike Adams and Rahim Moore rounded out the unit in the secondary. During one-on-ones between wide receivers and defensive backs, Caldwell drew the first big cheers from the fans. The receiver beat cornerback Tony Carter deep to the end zone, hauling in a long touchdown pass much to the crowd’s delight. It was just the first of several big plays for Caldwell, as he hauled in a deep pass from Manning on the sideline later during team drills. A few other big plays included a Bailey breakup of a Manning pass intended for Decker, followed later a Decker sideline catch in front of Bailey. The battle between Decker and Bailey has continued throughout camp so far. Defensive tackle Sealver Siliga batted down a pass at the line during the final portion of team drills. Decker, Porter, Syd’Quan Thompson and Drayton Florence took turns fielding punts during special teams drills. Denver’s top pick, Derek Wolfe, saw some second-team reps on defense during Thursday’s opening practice. After he was done taking first-team reps during the walk through on day one, Manning worked with Kuper on snapping the ball. Also during the walk through Linebacker Von Miller found himself matched up on Joel Dreessen who was split out wide. Miller took that opportunity to work on his bump-and-run coverage technique. Wide receiver Brandon Stokley was back at practice, and guard Chris Kuper participated in several position drills. Defensive end Jamie Blatnick (ankle) and defensive tackle Justin Bannan (calf) did not participate. Safety Quinton Carter was injured late in practice, and Head Coach John Fox said it "looks to be a right hamstring." Due to the weather the team had to move they training. The team finished practice on schedule due to an efficient transition to the indoor facility — known as the "bubble." After leaving the Dove Valley practice fields, players got straight on buses to the bubble. When they got there, they got straight back to work on a walk through session. 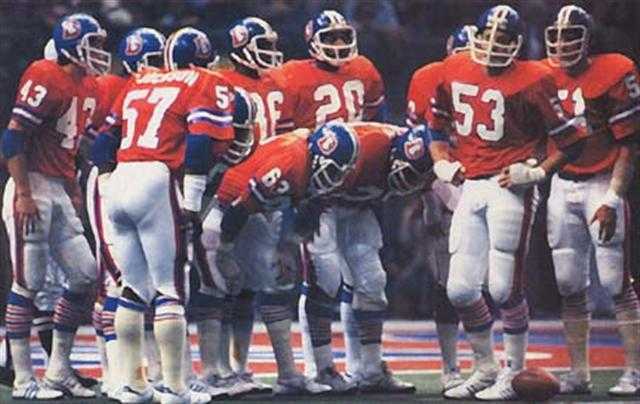 The Broncos didn’t let a roof over their heads prevent them from practicing kickoff and punt return drills. Instead of Matt Prater and Britton Colquitt sending the ball skyward, coaches would simply wait until the coverage team took off, then hand the ball to the returner. Offensive Line Coach Dave Magazu seemed happy with his position group’s performance on Friday, as he loudly praised the efforts of the unit throughout portions of practice. The newest member of the Denver Broncos, safety Anthony Perkins, watched the walkthrough from behind the defense. The Northglenn, Colo., native got some welcomed news on his way to watch the Broncos’ morning practice. Perkins worked out with the team during the rookie minicamp earlier this summer and has kept himself in shape since then, anticipating an opportunity. "I was comfortable with how it went," Perkins said. I thought it went well. I thought I moved around really well. I got good feedback from the organization. I just wanted to stay in shape and make sure I stayed ready just in case." After working out with Offensive Line Coach Dave Magazu’s son in Boulder, Colo., Perkins was headed to Dove Valley to check out the facilities when his phone rang. "I got the call when I was about 15 minutes away," Perkins said of finding out he was signed. "It was a little unreal." Perkins, who still watched the morning practice, stood next to and talked with Secondary Coach Sam Garnes throughout the evening walkthrough, trying to absorb as much as possible given his late start. "At this level, every detail matters," Perkins said. "You’ve got to be detailed in every single thing you do. Practices like that, you’ve got to be good at the details. I’m kind of playing catch-up right now, trying to get into the playbook and making sure that I’m able to be as detailed as these guys are that are practicing out there." The only player absent from Saturday morning’s practice was safety Quinton Carter, who injured his hamstring late in Friday’s indoor practice. Defensive end Jamie Blatnick was on the field but was held out of practice, Head Coach John Fox said, because of an ankle. Fox also reported that right tackle Orlando Franklin did not finish practice because of a "crick in his neck." Bannan, who was limited in Thursday’s practice and did not participate in Friday’s session, saw a few first-team reps Saturday morning. He wasn’t on the line full-time, however. When Bannan was out, Mitch Unrein continued to fill his spot at defensive tackle with the first unit alongside Ty Warren. Chris Kuper seems to be getting closer and closer to a full return to the offensive line, as he saw a handful of reps at right guard during team drills. When he wasn’t in, the position belonged to Manny Ramirez with the first unit. The matchup was Decker against Champ Bailey — and Decker made a move that faked out the 11-time Pro Bowler. Bailey recovered, but Decker still made a bobbling, diving catch right in front of the crowd. Needless to say, the fans erupted. Decker had another catch in front of Bailey later in one-on-ones, then when the offense switched to 7-on-7s, Manning hit Decker three straight times on the first three passes of the drill. Decker had a few more catches during full-team drills, one of which was right at the sideline, and the receiver kept running into the crowd — much to the fans’ delight. After Manning and Decker exited the final team drill, they drew loud cheers from the crowd. One-on-ones was an interesting drill for rookie cornerback Omar Bolden. On his first rep, he was faked out running to the middle of the field. The receiver stopped and cut back outside for a wide-open completion. On his next rep, however, Bolden intercepted a Brock Osweiler pass. Bolden’s back-and-forth drill continued on his next repetition, as Thomas beat him deep for a touchdown courtesy of a Manning pass, but he followed that up by snaring another interception on his fourth and final attempt. The offense won the majority of the one-on-ones between cornerbacks and receivers — including a touchdown from Manning to Brandon Stokley across the middle, when Stokley outraced his defender to the end zone — but the defense had its say as well. In addition to Bolden’s two interceptions, Bailey easily swatted away a pass intended for Mark Dell, staying with the receiver stride-for-stride through each one of his breaks. WRs vs. CBs wasn’t the only one-on-one drill during Saturday’s practice — running backs and tight ends worked to get open against linebackers as well. The most notable play from that session came from running back Jeremiah Johnson, who caught a one-handed, sliding touchdown past linebacker Mike Mohamed in the back corner of the end zone. Johnson shined using his legs, as well, finding the corner to gain a chunk of yards during a full-team drill. In the same drill, rookie back Ronnie Hillman found some space as he turned the corner on the other sideline. Linebacker Joe Mays had a big hit on running back Lance Ball lined up, but instead essentially chest bumped him and wrapped him up. The crowd recognized what would’ve been quite a collision had it been a game, letting out some "Oohs" and "Aahs." During an OL vs. DL drill, guard Zane Beadles stopped defensive end Elvis Dumervil short of the quarterback, which drew a little shoving from both players after the play. Later, rookie Derek Wolfe — who worked at both defensive tackle and defensive end at times during practice — beat tackle Tony Hills to get to the hypothetical QB. In the same drill, Robert Ayers bulled his way through the middle of the offensive line to make a play. Linebacker Steven Johnson had the second big hit of the day, this time meeting running back Mario Fannin in the backfield to loud cheers from the crowd. Danny Trevathan is playing at the Weak side Linebacker position for a look. He will end up rotating with Wesley Woodyard at times throughout the practice, but in this part of practice, Danny is getting the reps with the 1st team. Omar Bolden, Drayton Florence, Matthew Willis, Eric Decker, Syd’Quan Thompson and Tracy Porter are fielding punts shot by the Jugs machine to start practice. Two Broncos Ring of Famers were in attendance to watch practice up close — running back Terrell Davis and linebacker Karl Mecklenburg. The offensive and defensive linemen seemed especially excited to have pads on, as any drill they were involved in was physical and featured some loud popping of pads. That being said, everyone stayed on their feet for the majority of practice, as Head Coach John Fox has preached taking care of teammates. During a drill early in practice designed around wide receivers blocking cornerbacks downfield, Bailey broke away from a Decker block to make the tackle, drawing cheers from the crowd. A day after donning bright — almost neon — orange socks, linebacker Von Miller was back at it with neon green socks today. He was hard to miss throughout practice for that reason, but also for his play — he found his way into the backfield on a handful of snaps. During one set of 7-on-7 drills, Miller instead worked with the defensive line, going one-on-one against offensive linemen to work on pass rush. Decker, Willis and Syd’Quan Thompson fielded punts during special teams drills. During special teams drills, Osweiler worked on holding for field goals off to the side with long snapper Aaron Brewer. Rookie guard/center Philip Blake worked on snaps with the quarterbacks during another set of special teams drills. That is it so far, enjoy the videos and photos ~ Aussie. I hoped he would re-sign for what we offered, because we know and he knows he is better than what he has shown lately. However we offered him top 3 pay and he turned it down. Now we franchise him next year if we have to. Oh well. He's not Joe Thomas though and didn't deserve the same guarantees as his contract, which is what he was after. 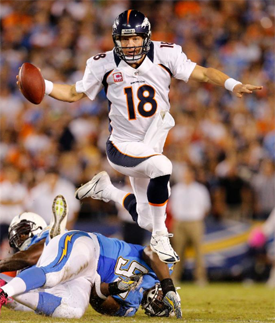 I think he is backing himself and the fact Manning is back there, to have a good year. Hopefully meaning a bigger contract for him. 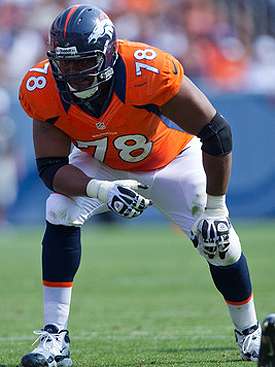 Clady I think will be signed at some point, just not this year.